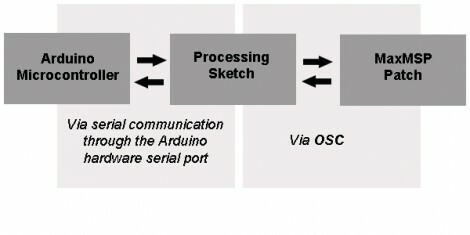 a free alternative can be pduino set of abstractions for puredata.it uses the firmata firmware. I am by no means “hating”, but I’ve been doing this for about a year now. I built a crossfader to complement the touchscreen software (touch_mix, also written in processing) I wrote that controls an open source dj’ing app called Mixxx. I’ve been actively dj’ing with it for months now. i still don’t see the point of osc. midi is still good enough for sending notes. if you’re going to send stuff via a serial cable why not do it directly to you max patch? or maybe he’s ordered an ethernet sheild and can’t wait for it to arrive! osc is packets of data over ip. its much more easy to use ethernet on a local network. you can broadcast to all ip too. and you can use wifi. and resolution of data is better. I chose to use OSC as it’s a protocol I almost fully understand, and the data can be sent to/received from other OSC devices like iPhone apps as well if need be. The best system I found for sending data straight the max patch was Maxuino but I couldn’t really get to grips with exactly what was going on in the patch, and I was finding it hard to extract the necessary code into my own patches. If i studied it more and learn more about Max I’m sure it would make sense eventually, but personally using OSC made more sense for me. I’m sure it wouldn’t be the best method for everyone though.